The Mochadoodle flavored coffee features a grated cinnamon, buttery hazelnut, and smooth chocolate flavor. These flavors blend perfectly together to create a decadent Mochadoodle experience that will taste like a warm, chocolate dream. 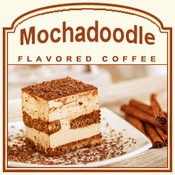 Made with 100% Arabica beans, this Mochadoodle flavored coffee features a deliciously smooth, full-body of flavor. Perfectly roasted, these coffee beans are infused with a great dessert-inspired taste. A heat-sealed valve bag will ensure the freshest coffee possible, which is why we freshly roast and ship this coffee on the same day. For anyone that likes a full-body flavor of hazelnuts and chocolate mixed together, this Mochadoodle will hit the spot. With a cinnamon touch to spice things up, expect this Mochadoodle to warm your taste buds as well as appease your chocolate-loving self!